Forced into an uneasy alliance the two princes journey deep into Akielos, where they face their most dangerous opposition yet. But even if the fragile trust they have built survives the revelation of Damen’s identity—can it stand against the Regent’s final, deadly play for the throne? Aside from the disappointing mismatching cover that ruined that minimalist aesthetic Pacat was really rocking, this was really good! 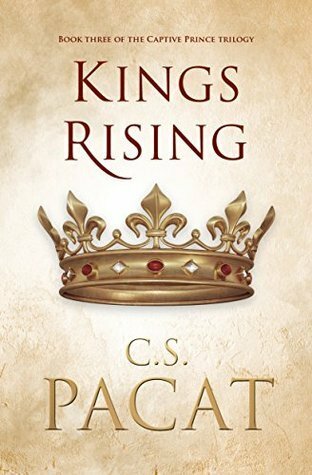 If I had to rank the trilogy, King’s Rising would come second to Volume Two plot-wise. The hate-to-love trope returned just when I thought it was going to disappear and I suffered this slow burn in the best way possible. Trying to keep spoilers to a minimum, I was speechless at how the plot points unfolded and how Damen and Laurent went about their problems. As readers we know what their characters are like and I think the characters themselves educate themselves as well. Damen, who’s not naturally as cunning as Laurent, learns a trick or two on how to manipulate people into doing his bidding. Laurent learns the Akielon way of doing things as well. We see two cultures learn and complement from each other and I think this is the most beautiful part of the story. There were scenes where I had to stop reading and clutch my chest because Pacat has a way of writing in such a straightforward manner that you feel pain in every part of your soul. I wanted to cry when the characters were in pain, I wanted to shout when there were plot twists, and I felt hollowed out when the series concluded. For those who haven’t picked up the series or were hesitant to, take this as your sign to read it. Just remember the trigger warnings. You know yourself best and even a story as great as this isn’t worth risking your mental and emotional wellbeing. I gave the entire trilogy a 5-star rating because it utilized my favorite hate-to-love trope so well that I think this really set the bar as to how that trope should be done.